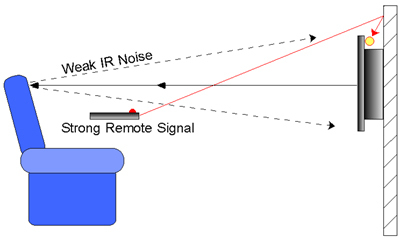 Procedure for mitigating spurious IR noise from Plasma and LCD monitors:Mount Receiver Eye either next to or behind the monitor. With the monitor on, rotate the Eye away from the reflected energy in the room toward the wall the monitor is mounted to until the blue indicator LED turns completely off. Even if the Eye is facing the wall the monitor is mounted to it will still see the remote commands.